Archive for the ‘How am I building a legacy of “sincere faith?”’ Category. Great Aunt Chris was not a mother herself but spiritually nurtured me by her example. Once homebound in her final years, she didn’t give up living for the Lord. She picked up the church directory, started making calls, and had only made it half way through when she already had enough women to come to her home weekly for Bible readings and discussions. Grandmama Grace loved and supported missionaries, blessed the poor and forgotten with visits, and baked cookies for anyone who needed cheering up. I couldn’t resist this cute picture of her from 1986. Aunt Nelda taught innumerable children in Sunday School through the years, including me. 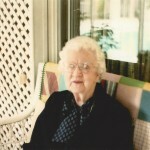 In her later life, she continued to volunteer and serve through a ministry for the needy, despite her own serious health issues. Others would have sat at home rocking away their last days, but not this spunky lady! I believe the richness with which they lived out their days and continued to abundantly bless others was a direct result of years and years of walking with and growing in the Lord. The same is true for my dear Aunts who are still kickin’ it! Auntie Di is a role model of looking for the good and speaking it out loud even in the hardest times, being a steadfast friend to others through decades and miles, and knowing how to have good, clean fun! What if you didn’t have a godly legacy left to you? Don’t despair, but let it begin with you! You can’t choose the family you were born into, but you can choose how to influence those around you! 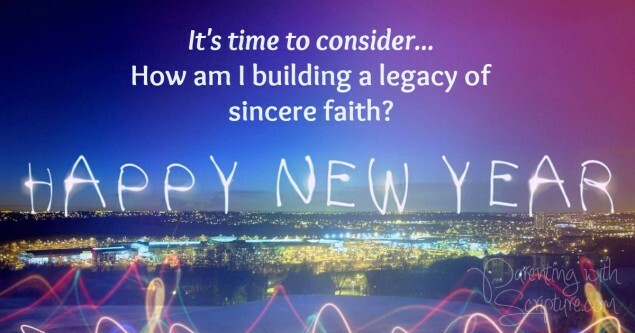 Today, prayerfully consider how you can start or continue a legacy of “sincere faith” through your life!